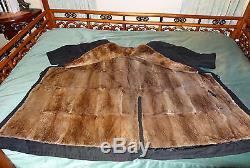 Rare Antique Vintage Man's luxurious Coat completely lined in fur with a fur collar. 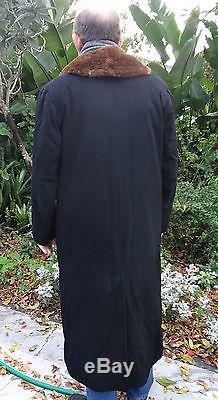 It is full length made of black wool. I wear a size 42 and it fits me and it would also fit a size 44. I do not know the exact date it was made but it is at least one hundred years old and possibly much more. 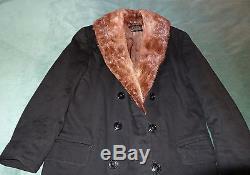 It looks like the kind of coat that J.
P Morgan or some tycoon of that period would have worn. The coat looks like it could be in the Smithsonian or another museum. It measures about 24 inches from arm pit to armpit. The sleeve measures 24 inches from the shoulder. The label is worn but it seems to say George L Griffin Boston Mass. The person I bought the coat from told me it had belonged to a president of the United states but I don't believe such stories because they had no proof. The armpits are lined with leather inside. This is something I have never seen before. I consider it to be in good condition for its age but it is not perfect. I noticed a small moth hole in the cloth when I was going over it with a lint roller prior to taking the pictures. A few seams between the pieces of fur, and a tear in the fur a few inches long in the lining need to be resewn and repaired and there are a few places of wear in the fur lining but not a lot. 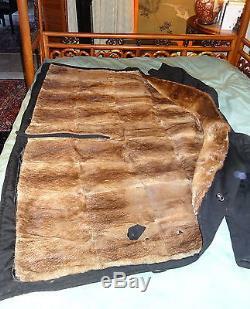 UPDATE 3/ 17: I just had a tailor repair the tear and open seams in the fur lining. The exterior is wrinkled from being stored. 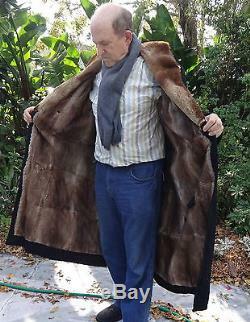 I wore this coat many times without doing anything to it and the new owner could do the same but if you are meticulous you would need to have work done on it. 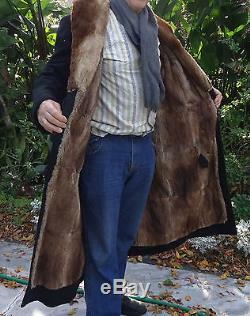 It is a great fun coat I enjoyed on many winter days but now I moved to Florida so I have no use for it anymore. If you want perfect you would be happier with a new coat. This is sort of like owning a 1926 Rolls Royce: not practical transportation and unlikely to be perfect.. 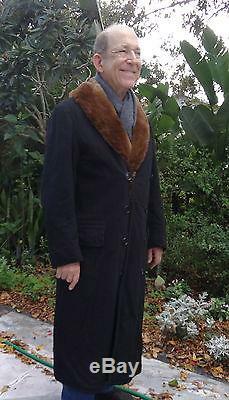 The item "Antique Vintage 1890's Tycoon Man's completely fur lined coat" is in sale since Friday, December 21, 2018. 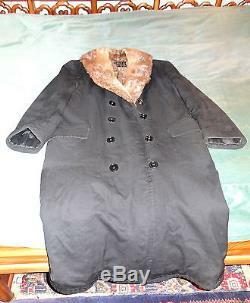 This item is in the category "Clothing, Shoes & Accessories\Vintage\Men's Vintage Clothing\Other Men's Vintage Clothing". 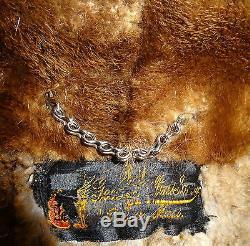 The seller is "debonairestud" and is located in Lake Placid, Florida. This item can be shipped to United States.